This is a remastered reissue of a 1986 release on Hannibal Records called "House Full" with the addition of two remastered bonus tracks, taken from a 1977 Island LP called "Live At The L.A. Troubador". 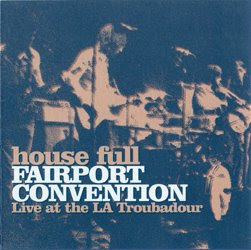 I think most people would agree that this is the best non-Sandy Denny lineup that Fairport Convention ever had. And the most rockin'. Fantastic record. Many thankx for this. I posted que second volume of the In-Kraut collection on my blog. If you have a little time, take a look. man!! I so desapointed, so, what kind of format is that? I can´t open it,is it possible to post it as a MP3, thanks. Hi maurizaorocha - sorry I don't do mp3's, only lossless. The file is a .flac image. Use the CUE Splitter, link for it is on the right hand side of the blog. You can split the image into individual .flac files and then convert them to mp3. Better though to find a way to burn the .flac file(s)- the quality is the same as the original CD.